The "B" in BCS, Bill was born in Milwaukee, Wisconsin. The blizzard of '78 sent Kathy, young Bill, and the studio to the beaches of Miami. Next stop: the beaches of Southern California. So in 1982, Bill landed in Los Angeles with a bowl haircut and bad habit of saying, "Back in MYY-AMI" before everything. Once that saying had been teased and beaten out of him, Bill made it through high school and was off to Santa Monica College. He spent the next 3 years balancing work at the studio, full-time schoolwork, and work managing an urban haberdashery. It was during this time that he really honed his people skills while accumulating an impressive collection of shiny and sheer rayon shirts. After SMC, Bill was off to the big leagues. UC Santa Cruz was just the oasis in the redwoods that Bill had hoped for. Starting off with a double major in Theatre Arts and Economics, it was at this time the first seeds of the superimposition of a business format over a creative industry began to form. Eventually he settled for being in the plays and finished up with a degree in Economics. Then he went back to reality and back to work...at the studio. The self-described "luckiest man in the world," Bill credits this title to his amazing fiancee Sue. They like to say they met the old-fashioned way... in a dive bar singing karaoke! They have a mutual love of gardening, road trips, big, ol' dogs, and holiday decorations (watch out Grizwald family-they don't just do Christmas!) The big day (wedding) is planned for summer 2012! Bill loves working with his hands. A fully-fledged motorhead, he has had his 1970 Mercury Cougar since he bought it when he was 15. Bill is clever and practical with his handiwork too; his ideas, planning, and labor are responsible for the recent re-design and upgrade of the studio space! Whenever he has the chance, Bill also loves to sing and play guitar, which is cool as long as you like Christmas songs or James Taylor. The "C" in BCS, Kathy was born in Fresno, CA, and is the oldest of 3 kids. Kathy is a true Baby Boomer; her dad served in the Army in WWII, and her mom stayed home and did her part stateside. From Kathy's earliest memories, she always loved dolls: changing their hair, their clothes, styling and restyling. It seems the die was cast early for Kathy. When her brothers were old enough, she began dressing them up, making them capes, costumes, and anything their hearts desired. Moving to Milwaukee brought the family closer to relatives and steady work for her dad. During her teen years, the 5'10 Kathy decided to enroll at the Rosemary Bischoff finishing school to gain more grace and confidence. With the Shirley Hamilton Agency in Chicago, she was the face of several print campaigns and had the pleasure of working with designers like Anne Klein, Halston, and Oscar de la Renta. In the evenings, Kathy taught advanced courses in modeling and eventually found her passion for faces while working with her students. During this time, she had her first opportunity to get behind the camera. As she worked, she simultaneously took classes at the Milwaukee Area Technical College and the University of Wisconsin Milwaukee. In 1976, Kathy opened Studio 512, shooting mainly commercial accounts and "filling in" with headshots and talent portfolios. A move to Miami, Florida, led to the creation of another studio (Kathy Ballerini) where Kathy grew her skills in natural lighting, which helped when the current studio opened up in Los Angeles in the 1980s. Always an active person, Kathy loves great outdoors. Jogging keeps her in shape, but going for walks with her grandson Liam is one of her favorite "active hobbies." Music is also close to Kathy's heart, and with the soundtrack of the studio ringing in her ears she is always game to go dancing, see a show, or enjoy an orchestral performance. Tim is a California native, born and raised in Alamo in Northern California. When it came time for college, he headed to Southern California where he earned his B.A. in Screenwriting at Loyola Marymount University (LMU). He then spent a few years freelancing with several production companies, working on various projects. A true jack-of-all-trades with a well-trained eye, Tim always excelled at post-production. This passion and talent eventually led him to Pictage, a highly regarded online photographic services company. In the 9 years he was there, he continued to be promoted until he was the head of the retouching department, overseeing the processing of thousands of images per day. From time to time, when his schedule permitted, Tim would subcontract with our studio as our retouch "top gun." Team BCS is proud to say that we now have our "Top Gun" available full-time to assist with all of our image processing and post-production needs. More than just a visual guy, Tim has followed his love of cooking and creating flavors into the restaurant business. Already a partner in a very successful local gastropub, Tompkins Square, he is now planning his next venture. In the meantime, he is pursuing his AA in Restaurant Management from the respected culinary institute Le Cordon Bleu. Tim has many other interests and hobbies. He is a passionate music aficionado with over 10,000 vinyl albums in his collection. He has been a DJ for many years, but now mostly spins for friends and family. He is engaged to his girlfriend Corrina; they will be married in summer 2012. Michael has been a BCS team member for over 15 years. At our studio we are all about hair styling, and we have been known to trim a few bangs. However, when we need the services of a truly talented stylist, colorist, and overall hair genius, we only go to one place to see one man: Michael. During the recent years of Bieber-mania and long hair on guys, Michael has saved more than 25 shoots with last minute haircuts on clients of all ages. Moreover, when female clients have special needs like a new style, cut, or color, they are always thrilled with Michael's talents and incredibly reasonable prices. Need perfectly natural highlights on that school-age teen that won't get noticed by the principal? Then you have your man! Michael will hand weave hair by hair so naturally that know one will ever know. Michael is the 6th of 7 children. He was born in Saigon, Vietnam. Talent like his does not develop quickly or easily. Always a high achiever, he studied hair styling at an early age and apprenticed for several years at different salons. Eventually he saved up and opened his own highly regarded full service salon with very loyal high end client base. His salon became wildly successful and continued to grow. It then became apparent that it was not going to be safe for his father (a politician) to remain in Vietnam so he decided that he would take his parents and come to the United States. Starting from scratch was hard but luckily he was connected via family friends with the "Magic Hair & Nail" Salon in Playa del Rey, CA. This was when we first met Michael and became hooked on the "magic" touch that Michael has. One of the hardest working people you will ever meet, Michael frequently still has the salon lights on and a client in the chair at 9:00 at night, and many weeks he is there all 7 days. Certainly not all work and no play, Michael is a regular at the gym and goes out dancing whenever the mood is right. Always the good son, he takes care of both of his octogenarian parents at his home. Both are still quite active, taking long walks each day. Michael says that they also order and watch every possible pay-per-view boxing & MMA fight. He does think it is a bit strange but just shrugs and says it makes them happy! Last but not least is Michael's fashion sense: not only does he have a one-of-a kind style, he also designs and has many of his garments custom-made. Nicole is a Midwestern girl from the start and California girl at heart. She was born in Freeburg, Illinois, and stayed there during her early years. When college called, she pursued her degree at Southern Illinois University. She then moved to sunny Southern California and began working at a consulting company as a recruiting coordinator, event planner, and office manager. After seven years in corporate America, she chose to attend the University of Southern California to study Health Promotion and Disease Prevention. Nicole brings this copious and varied skill set to Team BCS. In the time she has been with us, we have reorganized, catalogued, and streamlined much of our behind-the-scenes systems. Knowing where each and every wardrobe item, prop, and set piece is located makes our shoots as smooth as can be. She has brought guidance and organization as the office manager. Her sweet demeanor and calm, unflappable nature is a much appreciated addition to the frenetic pace of two perfectionist photographers  . Knowing that someone so capable is handling the phones and helping with communications has been very freeing for us. When she is not at the studio making life easier for us, Nicole spends her time working with another small family business that makes wands. No really! The magical wands are gorgeously handmade by the Whirlwood Company which specializes in Harry Potter-esque tools of wizardry. Nicole spends much of her free time in the kitchen cooking up delicious food for friends and family. Nicole is passionate indeed about all tastes, making everything from Indian dishes to baked goods. Her favorite person to cook for, though, is the love of her life and all around great guy Cody. Through a funny twist of fate, Cody is actually a long-time friend and was once client of BCS over 20 years ago! The comfortable and private green room/lounge has a beverage-stocked fridge, HD TV with DirecTV, and WI-FI. A bathroom with shower is for exclusive use of the individual client (and their entourage). The onsite office suite includes printing, fax and scanning services available for clients at no charge. We love music and have a baby grand piano, full drum kit, violin, trumpet, and several guitars available to inspire and distract you on your shoot day. Cathedral ceilings offer singers and musicians alike beautiful acoustics. The on-site basketball hoop, stationary bike, and yoga mats are there if you want to get pumped or just relax before, after, or during your shoot. For families with little ones, we have a huge toy/activities box. We also have a crib on-site if someone needs a little nap time, and high chair in case they get hungry. We are a dog friendly studio. You can always bring your pups along; just let us know they are coming so we can be ready for them. 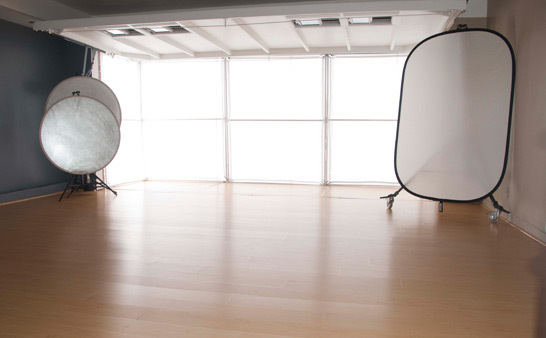 Our main, natural-light studio has 24 feet of unobstructed western exposure. It is climate-controlled and comfortable in all weather, so we can shoot rain or shine! We are located on a 6,000+ sq. ft. lot with dozens of additional natural light locations and settings on our own property. Music makes everything more fun! We have a great sound system and stream music all day; we will make you a custom station just for your shoot. Of course we can always play your iPod, CDs or MP3s! Our indoor fashion studio has 27ft high ceilings, various staging options, and a complete Speedotron Black Line Lighting System. Proudly shooting Nikons for 35 years, we shoot full-frame (FX) cameras in RAW, and we color correct and edit all images on site in our 2 editing bays with 30 inch color-corrected monitors. Our studio is located 5 minutes from LAX, and we can pick you up or drop you off if you need us to. Schedule ahead of time so we can make arrangements. Toes beach is a 5 minute drive or a 15 minute walk along a natural bluff path in view of the Ballona Wetlands. We have boogie boards and beach towels if family or friends want to hit the beach while someone on their team is getting their shots done. Playa del Rey is located adjacent to the Ballona Wetlands which is around 600 acres of permanently-protected precious wetlands. Today it is home to a freshwater marsh habitat that has attracted over 200 species of birds, some of which are now returning every year to nest after more than a 70 year absence! Ornithologists, bring your binoculars. We have Pacific Pizza (also salads and calzones), a Subway, and Yum Yum donuts walking distance just across the street, and there are many other dining options within a short walk or quick drive. World famous Venice Beach is 5 miles away (a 15 minute drive) and a must-see. There are tons of food options, and of course the people-watching is second to none! The Santa Monica 3rd Street Promenade is 8 miles away (20 minute drive). Offering world class shopping and the Santa Monica Pier all within walking distance from the promenade. People-watching is pretty good here also! In addition to the many overnight accommodations around the airport, we have a local hotel and a bed and breakfast that are within 5 minutes of the studio and offer discounts to our clients. Contact us for information!